Guess we'd better get up to the sugar woods to finish repairs. Then Scott will begin tapping! The sooner the better...mid February is the time when the trees are itching to run and we're itching to make maple syrup. A perfect day to start tapping...and Scott was up in the woods all day. He made good progress considering the deep snow...and will continue tomorrow. He's trying to get geared up for March 1 as the weather looks good over the next few days. Meanwhile we've started sugar on snow at the farm. Samara happily demonstrated for folks. Another good day for tapping. Sun and cloud. Below zero. Good snowshoeing. We are blessed. Scott says he's 25% tapped in. Done the steepest part of the sugar woods. Meanwhile, the restaurant and farm were VERY busy yesterday - over 300 people! Sugar on snow, dogsledding, tours, brunch - lots going on. Here goes Scott, up the hill to the sugar woods on a sunny day. What great conditions to be in the woods on snowshoes. Small blessing...when Scott is feeling like...well...not very good. Lung infection. Once again, sugar season dawns and he's sick! Still, we've got to get tapped in so he's picking away at it. We are nearly 1/2 way through. Way to go Scott! Samara and I are laying low today with the flu/cold as well. Sympathy to all you thousands of fellow Nova Scotians who've been suffering with this one. Tomorrow CBC news will be taping at our place. Oh and today Christine Whelan from Wonky Eye Photography is coming to photograph Scott tapping. The light in the afternoon will be lovely. And the weekend sounds like fine weather for visitors...but no sap. We need a really good thaw to wake these trees up. As you can see, we still have a lot of snow up here. Temperatures have been around 0 to 2 degrees...and lower. So no tapping these past two days. Not that the weather wasn't fine...it's just that Thursday Samara was sick and Quita had groups at the restaurant so Scott was parenting. Then today it was running around picking up supplies while BOTH Quita and Samara were...home sick. All are on the mend now! It's snowing quite steadily right now. Scott has looked ahead to next week and figures he can finish on Tuesday and Wednesday. Which should work out because we haven't had any sap temperatures yet. Good thing. Above...that's the original sugar shack that Bob Williams built back in the 70's, about 20 years before we met him and began our apprenticeship. This month will find the almost-70-year-young Bob cycling in Vietnam! You go Bob. Our neighbours (Maple Mist) are making syrup! They are down in the valley in Earltown...while we are up on the "mountain" at Sugar Moon. That's okay...Scott's still trying to finish tapping. The weather wasn't great for tapping Tuesday and Wednesday (I think...it's all a blur now) and then he got sick...again. Flu. Up and about finally today. Determined to get to the woods tomorrow. Sounds like the sap should hold off til the weekend - the weather gods are helping us. It's been a busy couple of days, mainly with groups at the restaurant and still...sickness! Poor little Samara has been home a good week now. She's almost there, but not quite. So she helped give a couple of tours today. We had 48 nutrition students from MSVU and TOTALLY enjoyed having them. Tour, red fife pancakes and lots of talk about local food, with Av Singh as well. Taps? Scott still has about 400 left. It's tough to get up to the woods around everything else and he bummed his hip snowshoeing in the wet snow the other day. What next? Things seem even busier this year than ever. But boy we have a great bunch of staff running the restaurant and tours this year. A pleasure! Scott finished tapping yesterday! Now we await sap. Today is supposed to be warm (8?) and sunny (?) so it may come today. Right now it's overcast and minus 3. Scott got up on the roof to mount the steamstack - a sure sign things are happening with sap. Had a little sap today, but not much. The northeast winds kept things too cool. Our fingers are crossed for Monday-Tuesday! I'm so sorry about the lack of updates these past couple of days! Samara and I went to Halifax Monday so that we could be on Global TV morning show at 8:15 am Tuesday morning. She and I had a much-needed mini-vacation at the Prince George. Scott fired up on Tuesday because he finally had enough sap. When we arrived home at 6:30, we tasted what he made. What beautiful syrup! Today he boiled again, from around noon to 5 (he's cleaning up and bottling now). David Hachey came over from Pictou Co. to learn how to fire the evaporator. Great to have his help! Traffic at the farm was VERY busy yesterday. This afternoon it was a little less in the afternoon - likely because of the rainfall warning that didn't materialize. We had a special group of new Canadians in the morning, the majority of whom were Nepalese. Looks like we will be boiling again tomorrow as the sap is still running, a small stream, and it won't get cold enough tonight to stop it. Scott says it doesn't sound like it will get cold til Friday. Plus 2 and 3 called for on the weekend. Will that bring us sap? We'll see! Update about the Nova Scotia maple season from Dale MacIsaac, maple specialist as of March 11: "Sue and I visited a few producers in Cumberland yesterday. Some have made syrup, but some are still tapping trees. For those tapped up, the sap has not been running great. Syrup made so far is very good. In the south west of the province, I have heard reports that they have ¨÷ to ¨ö of an average annual production. Hopefully some of the good sap weather will come our way!" But we have since talked to Cumberland Co producers who have made quite a bit of syrup, some having trouble keeping up! Doubt we'll be boiling tomorrow...not enough sap. Today yes...but just a small one. Saturday? We'll see what the weather brings. Nice day here today! The sun is peeking through and it's mild. Good, short boil. Beautiful sunny day. Still cool. That's good. Busy happy day with visitors for March Break. Flurries and minus 3. No sap today! Happy Birthday, sweet Maple Man! And...another cold day! Minus 17 this morning at 7 am. And snow on the way. We did not have any sap since Thursday...but we're patient. It will come. We've only boiled three times. There's more on the way. And this is the nature of maple sugaring. Waiting. We had a wonderful weekend with so many happy visitors. Grateful. This latest storm that Nova Scotia experienced today brough LOTS of snow to our side of the mountain. It's a winter wonderland! Collected a very little sap yesterday when the sun briefly came out...but still not enough to boil. Our farm is higher elevation than others and it seems that our temperatures are just not getting quite high enough these days to bring sap. Earltown's Annual Maple Festival Pancake Supper is always on the last Saturday in March: this year it's Saturday March 30. Well Scott boiled a little today. We had maybe 20" in the tank so he cleaned it up...along with Dave Hachey's help firing. Made a little delicious syrup. What's next? There should be sap coming later this week. We can only hope. This coming weekend will be very busy: Easter Weekend, open Friday-Saturday-Sunday-Monday, 9 to 5. 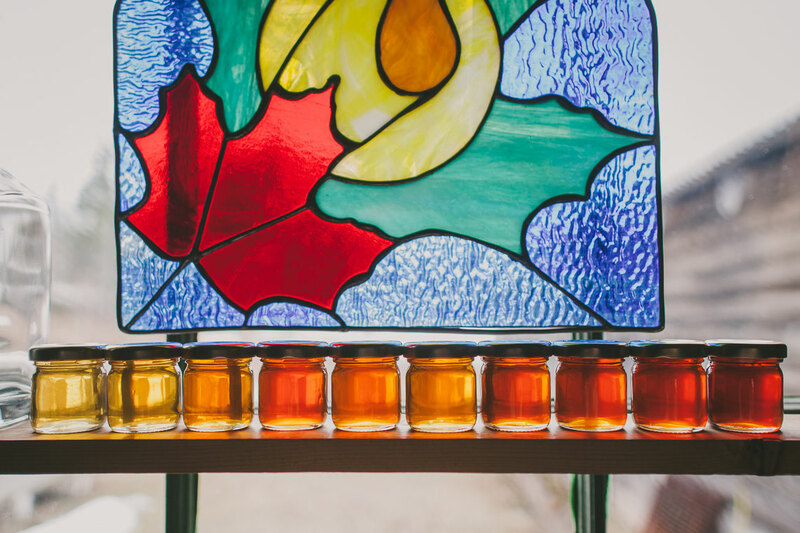 Earltown Maple Festival takes place on Saturday (always the last Saturday of March) between 10 and 6 - a great slice of rural Nova Scotia life with pancakes, sausages, baked beans, biscuits, sweets, live music...and Sugar Moon maple syrup. We're proud to donate the syrup for this supper; the Earltown community hall is the heart of this area and is maintained by hard-working volunteers. You'll see some of them smiling and cooking and seating and clearing and pouring on Saturday. Come support Earltown community! And...if the weather does what it looks like it might do...we'll be boiling! No sap to speak of all week. Darn! Still, it really sounds like we'll get some over Easter weekend - the sun will be out and those trees should thaw and run. We are open Fri-Sat-Sun-Mon 9 am to 5 pm. It will be a lovely weekend to hike in the spring woods, taste the new syrup of the season on Red Fife pancakes and enjoy sugar on snow. And we are excited because eldest daughter Eriel is coming home to help out on Sunday and Monday. Hopefully she'll be assisting her dad by firing the evaporator! Say hi when you're here. A full tank as of this morning...and should be more today as the sun warms up the trees. yahoo! Yesterday was a great boil. Fired up at around 12 and boiled til around 7. Made delicious syrup. Had lots of visitors who were happy to watch, smell, taste and learn about maple syrup! Today is another perfect blue-sky day. We cleaned up the sap yesterday. We'll see what comes today. It will run for sure, but how much, we don't know. We may just end of collecting today. Regardless, we are expecting to boil tomorrow. What a great weekend. We're blessed. Earltown Maple Festival today: 10 am to 6 pm. Boiling today! Sap ran pretty well yesterday and we have more than a tank to start the day. Scott and Dave will likely fire up at around 11...maybe 12. A sunshiney blue-sky day again. And...Eriel didn't fire with her dad as hoped, cause she was a bit under the weather. Spent quality sister time with Samara instead. The farm is VERY busy in the sugar season, especially on a sunny day with sap running. Go HERE and scroll down to find "6 Tips for Visiting During the Busy Sugar Season". THe wait for a table in the dining room can be long. Read these tips to make your experience that much better! Scott and Dave are boiling right now. Fired up at around 12:30 and stopped firing at around 6:00. Great boil, and delicious syrup that didn't have a hint of "end-of-season" flavour. Interesting. Could be a productive season after all. This was #7. We typically boil 12-16 times in 3 to 6 weeks. Eldest daughter Eriel is down at the camp with her dad. What a treat to have her here. We had so many original customers here this weekend. Sap, sunshine, customers - we are grateful for it all. Sap slowed down tonight. Scott doesn't expect we'll boil again for a couple of days, looking at the weather this week. Tomorrow, 40 some young hockey players, including some from Serbia. Can't wait to meet them all! Then a busload of Happy Wanderers from the valley who come every year. Should be a fun day! We are still booking schools in April. No sap yesterday. A little today but not enough to boil. The sun shone very briefly today, the temperature spiked above zero...briefly...and that was it. Wild winds, blowing snow as well today! Should get sap tomorrow. Weather sounds decent. We're ready to boil! Boil #8. We had about 12 inches in the tank this morning and then it ran in the afternoon. Scott's down at the camp with Dave, boiling. Great flavour! I'm just about to go deliver the truck so that he doesn't have to walk home after boiling. No time to take a real-time photo...sorry! But hey...Scott looks exactly the same as he did in 2011! Samara and I are preparing to do "la tire" for everyone at Ecole Acadienne de Truro tomorrow! We'll do it for all classes every half hour. It's to celebrate three things: the sugar season, an amazing school...and our "sugar baby's" 8th birthday tomorrow. Bonne Fete Samara! Happy 8th Birthday sweet sugar baby Samara. Scott is home, having a late supper after the boil. Says we are better than 1/2 a crop at this point. In memory of Sybil Williams...whose son taught us to make maple syrup, who made the first pancakes at the farm in the 80's and whose pancake recipe we inherited. Rest in peace. Great run yesterday. Collected lots of sap. Boiling today! Firing up at 11-11:30. Good boil today. Lots of interesting happy people. Tomorrow we'll do it all over again, firing up around the same time (11-11:30), only on a beautiful sunny day apparently! Sugar-on-Snow all day yesterday at Ecole Acadienne - very fun!! Sunny day...but supposed to rain later. On Sunday we collected enough sap to boil on Monday. Made quite a bit of that dark, strong "end-of-season" syrup. But it sounds like we should get at least another run sometime during this coming week. The weather predictions keep changing (in terms of temperature) so it will be close! Today it's 48 Grade 2's from Ian Forsythe in Halifax. Been coming for over 12 years! Sugar on snow continues til the end of April...and for any groups that book into May. We have an ice crusher so don't have to rely on snow. Despite only "warming up" to plus 2 after minus 3 last night, we did collect sap and will be boiling tomorrow. As planned, boiled yesterday. Good little run. Made beautiful dark end-of-season syrup. Scott expects the sap to run today as well. It got pretty cold last night (minus 3 I think) so we'll collect today, see what comes of it, and boil Friday and possibly Saturday. It didn't warm up, thanks to those north winds blowing over the ice in the Northumberland Strait, says Scott. So it ran a little every day and now we have a nearly full tank and another nearly half full. We'll boil tomorrow. The last boil of 2013. The syrup's been strong and dark, the sugarmaker has declared it's the end. It's based on the quality of the sap, the taste of the syrup and the state of the buds on the trees. It's time. It's been a good season. We will be firing up at around noon. Sugar on snow, tours, brunch, maple tastings all day. Thanks Dave Hachey for a great season of firing. We're done! Boiled Sunday and made lots of great syrup. People tasted all day, hot off the press, and loved it. It was really a perfect day: lots of folks out for hiking and brunch and sugar on snow. And now, Scott has pulled the sap line. We are not collecting any more and the season is over. We're pleased with production. It's more than last year, less than 2011, and more than 2008, 2009, 2010. We are grateful for all of it. We used most of our firewood. Have about 1 cord left. Now the cleanup begins. Scott and Dave will spend a long day cleaning the evaporator, and all the stainless equipment. Then another few days "tapping out": cleaning the tubing, plugging up the spiles and pushing the tubing up the tree until next year. That's a lovely time to be in the sugar woods: sapsuckers, spring beauties, scarlet cups and sunshine. Meanwhile, we are offering the sugar season experience til the end of April, with "sugar-on-snow", sugar camp tours, all-day maple breakfast, amazing hiking, and maple tastings and shopping. Didn't make it to Sugar Moon this spring? Don't despair: we ship within Nova Scotia. Email Quita to order your delicious taste of spring! Ask for early season, mid season or end-of-season syrup. The taste and colour range from light-coloured and delicate to darker and stronger flavour. We have lots coming up on the farm, including Chef's Night, hiking events, a new brunch menu and more. Sign up for our Email contact list to hear all about it! Thanks to everyone who visited this spring. We are thankful every day for the wonderful customers who come every year and become more like friends and family. And we appreciate all the new visitors and look forward to seeing you again throughout the year. And thanks to the best sugar season crew ever! It was a blast working this crazy season with you all.